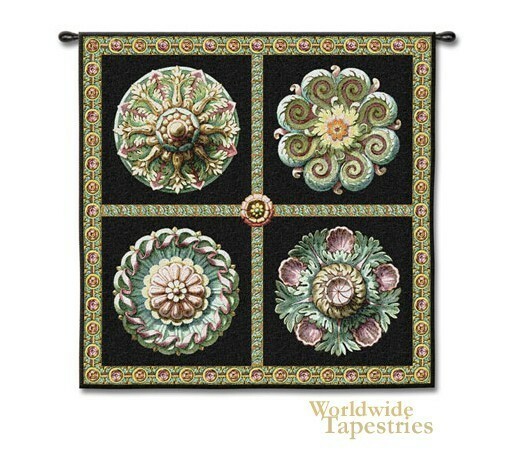 Filled with whimsy and beauty, this elaborate art tapestry "Rosettes on Black" shows the work of artist James. The beauty of rosettes as an architectural and decorative feature of homes is celebrated to fell glory here in this piece which takes the rosette and turns it into a colorful work of art. The symmetry and balanced structure of rosettes evokes themes from nature and is represented in these rosettes by flowers, leaves and fern curves which is so mathematically precise in its formation, that it can be represented by the Fibonacci sequence. The use of the sophisticated blue greens are just beautiful, as are the use of violets and yellows. An ornate border completes the delightful work. This contemporary art tapestry "Rosettes on Black" is backed with lining and tunnel for easy hanging.